So the chief secretary to the treasury, David Laws, has resigned his post in the coalition government because of an expenses scandal that has also exposed that he is gay. It's a situation so tricky that on his programme this morning, even Andrew Marr said 'for once, I have nothing smart to say about it'. The facts are that between 2004 and 2007, David Laws claimed expenses on properties he had rented from his long-term partner, James Lundie. In 2006, Parliamentary rules were changed to forbid MPs from 'leasing accommodation from a partner'. It's debateable whether the word 'partner' is just a catch-all to include husbands, wives, common-law partners and civil partnerships (which have been legal in the UK since 2004), but Mr Laws clearly believed that his own relationship with Mr Lundie could not be described as fitting the parameters of that clause. Furthermore, to protect his own privacy in an environment where the prejudices of the public could have prevented him from serving them, it looks as if he continued to claim expenses until such time that he could cease doing so without it drawing attention to his private life. I do wonder if any straight relationships were exposed in a similar way in the last round of expenses scandals: an unmarried MP in a relationship claiming rent on a property owned by their partner. If there were, would they just have been all part of the same scandal, so that the nature of their relationship might not have been clear, or is it just that the press wouldn't have felt the need to expose a heterosexual relationship because it doesn't have the whiff of scandal that a homosexual one does? Whichever way we look at it, David Laws is clearly a victim of homophobia. He's felt compelled to live in the closet, keep his relationship a secret and maintain a practice of claiming for expenses to as not to draw attention to his private life. Though his resignation was prompted by those expense claims - which he's vowed to pay back - some might say that there's an issue of trust here that David Laws has betrayed. It might even be suggested that gay people who live their lives in the closet cannot be trusted with a position in public office. But we also have to look at the reasons why a person might choose not to come out. After all, how many MPs have lost their seats because of revelations about their private lives? David Laws had to resign because he is gay. What's interesting is that, unlike almost every other MP to have resigned a post because of a 'private matter', the view here seems to be that he is an 'honourable man' - and without any of the irony that the phrase might carry from Marc Antony's use of it. Could this in fact be a turning point - that a member of parliament might not have to resign because of his or her sexuality? Well, that's down to the voters and, sadly, the reactions from the Daily Mail this week could be seen to reflect many of them (I won't provide a link to that, simply because it only helps them in the long run). Last Wednesday, I was honoured to be among the guests to witness the election of Camden's new major, councillor Jonathan Simpson. The mayor is joined on the council by new deputy leader Angela Mason, a major figure in gay equality campaigning since her days as head of Stonewall in the 1980s. The inauguration took place during the council's annual general meeting and entertainment was provided by, among others, the London Gay Men's Chorus... and a local resident who had some rather forthright views on one of the other councillors. Camden council has had its troubles recently, but the new mayor's agenda of promoting the area's wealth of musical talent and fundraising for its venues seems to be very welcome. As so many of the musical entries I've written in this blog were inspired by tickets provided by him as his 'plus-one', I can wholeheartedly vouch for his passion for live music. I'm sure he'll make great progress for the council and for Camden in the next 12 months. Congratulations, mate! Thanks to the wonders of BBC iPlayer, I've managed to catch the final episode of Ashes to Ashes. No spoilers in this post, except to say that I appear to have predicted the ending in this post from last week. I loved that. A really emotionally satisfying ending that makes sense, seems to tie up all the questions, leaves room for viewers to piece together more of the clues and - yes! - makes me want to go right back to the start and watch it all again. Some lovely cultural references there too - notably Angel Heart, though they at least didn't go the whole hog and give the relevant character an obvious pseudonym like Louis Cypher. 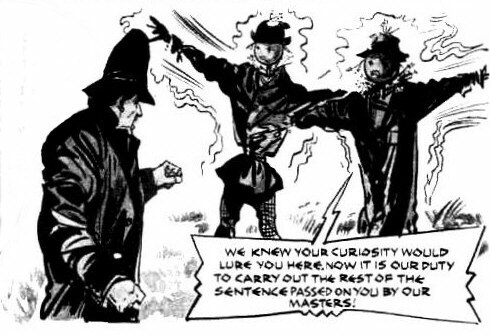 There was also a moment where I wondered if there was some kind of inspiration from the old TV Comic Doctor Who strips, where the Doctor was dragged off and forced to regenerate by Time Lord-controlled scarecrows. But thankfully, that's probably more to do with my hand-over than anything intended by the writers. Thanks Ashley and Matthew for a brilliant series - and cheers, Gene - you always will be... The Guv. In ancient times, like Greek or Roman or Egyptian or those other places like Mesopotamia that I can barely spell. It doesn't matter. The point was back in the past when everyone except the rich went about on foot. Back then, the rich people used to pay people to bring them their news. It was a hazardous occupation. You'd be despatched from your News Hut to a location many miles away. Possibly crossing a continent just to get to the location. You might manage to do some of the journey on foot, but inevitably there'd be mountains that needed climbing, dense forests that would tear at your clothes and flesh, wild beasts with hunger in their eyes, enemy armies looking to make sport with a weakling from the other side of the border and even cut-throat thieves who'd think you were worth the risk. And then you'd arrive at your destination and find out what was required. If it was bad news, you might be thinking whether or not your life would be immeasurably safer without your master's unpredictable temper being the deciding factor in whether you have an early death or not. The return journey would be even more dangerous and eventually, after weeks away from your master's home, you'd return. You'd stagger up to his throne, tell him the news... and then die, exhausted, at his feet. I mention this because in the week leading up to the coalition government, Sky News got more attention than ever for some spectacularly unprofessional behaviour on the part of its reporters. First, Kay Burley bullied a protester on live TV, refusing to let him speak and being generally hostile. Then, a live report on Tuesday saw Adam Boulton completely lose it in an exchange with former Labour spin-doctor Alastair Campbell. Campbell remained calm and authoritative while Boulton spat furiously and accused him of somehow manipulating the election into a situation where... what, Adam? You're claiming Campbell and Mandelson conspired to make sure the Conservatives got into power? You sad, paranoid idiot, working for an international joke. A terrifying, powerful, disgusting joke, but a joke nonetheless. It was magnificent to see, and courtesy of many YouTube viewers, it's now been seen by so many more people than were watching at the time. - Boulton v Campbell on Sky News. 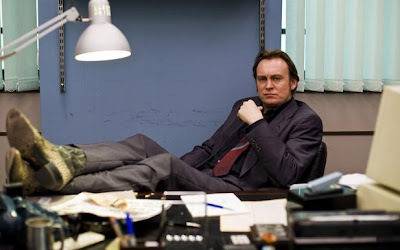 "Dignity... dignity..."
I'm writing this half an hour before the penultimate episode of Ashes to Ashes hits our screens. They've been weaving this particularly media-literate modern fairy-tale for the last five years, the first two of which as Life On Mars. Is the gruff thuggish Gene Hunt the retro hero he was hailed by those kind of tedious Sun readers who believe the phrase 'political correctness gone mad' is an actual point to make? Or is he the villain, waiting to be exposed? Was Sam Tyler mad, in a coma or a time traveller? And if he was one of those things, is it the same for his successor, Alex Drake? Are any of those supporting characters directly involved, or just hapless victims? I genuinely don't know. After series one of Life On Mars, I thought I had it all worked out - and I was right, kind of. The characters were all living on Mars in the future, and BOTH realities were an illusion. Except... this didn't happen in the version shown on British TV, but was the resolution of the US version. Some thought it was weak, but I loved that ending because it dared to be different from everything else on TV. For those who've stuck with it, Lost is also approaching its finale. Like Life On Mars and Ashes to Ashes, Lost has relied upon withholding information to build its mystery. And similarly, it's this perverse restriction of information that has made these extended conclusions such essential viewing. Unlike other long-running dramas that come to a natural end, we still don't actually know what these shows are about, and whatever they reveal in the final seconds will probably be the first thing mentioned in every review from now on. The Prisoner wasn't as baffling as many lazy critics would have you believe - it's really only that final episode that refuses to give us the neat conclusion we'd all hoped for (I say 'we', but no-one I know watched it on first transmission, because it's not the kind of thing my parents watch and none of my mates were old enough). The Prisoner is dead easy to understand though - if we only take it at face value. If we just watch the series knowing that the central character IS Patrick McGoohan, it all falls into place. A frustrated actor creates a situation that will eradicate his feeling of typecasting, only to replace it with a completely different feeling of typecasting that he can never escape. The new version of The Prisoner, currently showing on ITV1, is harder to explain. How could they get a concept with such potential and make it so relentlessly dull as to make it lose the channel about five million viewers every Saturday night? Such a waste. Lost, meanwhile, has never interested me. I was bored rigid by the very first episode, so I'm pretty sure that even once it's finished and friends tell me what happened, it'll mean nothing to me. But for those of us who've followed Gene Hunt's story, I think it's safe to say we're all hoping for something utterly barking. Unlike those original viewers of The Prisoner, we WANT this to be completely baffling. We WANT to feel slightly cheated. We want it to be nothing like anything else we've ever seen - because if it's even remotely guess-able, we really will feel let down. So, with five minutes to go before part one of the Ashes to Ashes finale begins, here are my two guesses. 1. They're in purgatory, limbo or some other pre-Heaven place. The solution will be that they discover they're all dead and had to atone for past sins. The thing is, we might welcome a quasi-religious ending in an American film, but would secular TV Britain be happy to accept an ending where they say God exists? 2. It's 'Six Characters in Search of an Author'. They discover to their horror that they're fictional characters. Some of them struggle to cope with the news, but the others band together and tell them - Sod it! We feel real, so we're real. They sack their author (Jim) and tell him to get out. A Twilight Zone ending would be great, and on the verge of nihilism they could make something rather rebellious and uplifting. Right - it's on. Let's see if they're going to string this out right up to the wire, or if they'll give us any clear confirmation at all. I'm not a political animal. I'm interested in politics and I have my own political preference, but like many, I'm reluctant to get too involved, because I've seen too many people get eaten up by frustration and disappointment. Better to stand on the sidelines and offer a critique on the passing parade. So, I'm writing this more as a bookmark, to put together some thoughts this evening. For the Labour Party to win a third term in office was a historic moment for British politics. The likelihood of them securing a fourth term in 2010 was unlikely at best. More, a Conservative win was pretty much inevitable. But a majority win was not. Even before the election was announced, most statisticians would have reminded us that massive swings tend not to go beyond about 4%. All of those polls predicting 20-point leads for David Cameron, frankly, might as well have been held in Narnia for their resemblance to reality. If the best the Conservatives could hope for was a 4% swing, the very best they could have hoped for was a hung parliament. This is what the Liberal Democrats knew, and they knew that whoever secured the bigger share of seats, the centre party would have the casting decision in whether or not they got to govern or not. 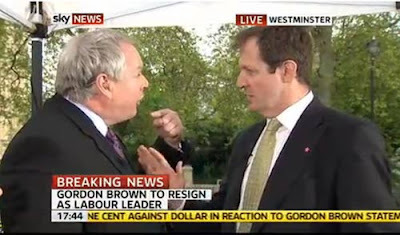 We can ignore all of those Tories bleating about Brown not having a moral right to govern in these last few days. He every right to govern, as set out in the constitution. Cameron did not, however, have a right to demand to be given the first opportunity to set in motion a coalition. Opposition tends not to win elections - the sitting government tends to lose them, and inheriting the damage caused by the Iraq war and the global recession, it was unlikely that Labour's successes in looking after our pensioners would win them many votes. As (of all people) Lembit Opik pointed out today, the Conservatives didn't win this election. In an 800-metre dash, they fell at 700 metres; they got further along than everyone else, but didn't complete the course. it could be argued that many of the new votes they attracted this time were the result of negative voting - people who've had enough of Brown and want to see the back of him, rather than positively voting for Cameron. Likewise, most people in this election voted for someone other than the Conservatives, and many of those votes would have been a negative vote away from the Conservatives rather than specifically a vote for Labour or the Lib Dems. The Conservatives need to remain humble here. They didn't receive a vote of confidence from the public and they'll need to negotiate at every turn. If they don't, they'll lose the ability to govern at all. Similarly, the Liberal Democrats have secured their greatest opportunity to govern since 1918. I hope they don't waste it by punching above their weight or not picking their battles wisely. As a Labour voter, obviously I believe Labour are better for people like me and my family. I'm not blind to their faults - I still believe tuition fees to be a betrayal of their core values. But I know many people cannot get past the Iraq issue and it's meaningless to try to debate that, because minds are closed and set, and nothing I might say can open them. The Conservatives also supported the move to war - their track record in both the Falklands and the first Gulf War meant they couldn't very well not support it. At the time, the Lib Dems opposed it, but then it's easy having principals when you'll never have to make the decision yourselves. Now though, they might. Many people have attacked Nick Clegg for considering an alliance with the Conservatives. Politics isn't about only working with your friends. You have to be able to work with your enemies too. Believe it or not, I think Clegg's being very brave here. If the Tories are as bad as some of us suspect them of being, with any luck, they'll be restrained to some extent by their their new allies. If they get out of hand, the Lib Dems can pull their support at any point. Whoever's in power, they've got some tough choices to face. Had they won a majority, I suspect we'd have been in a terrifying position as the Tories could have been insufferable and spiteful, as they were post-1979 (if that's not your view of that time, you probably didn't live in Liverpool, Glasgow, Newcastle or any of the mining communities which, for some people, felt like they were being targeted for their opposition to the Tories in the mid-1970s). Now, we might be able to benefit from Conservative economics tempered by liberalism. It's not what I voted for, just as I'm sure it's not what Conservative or Lib Dem voters wanted either. It's what we've got, though, and I'm just hoping that with so many people awakened to politics this year, perhaps this coalition will create a new generation of activists, which should be a good thing. The word 'rare' is overused. 'Rare' photographs, 'rare' outtakes'... whenever people talk about archive material, it seems they love it to be akin to a lightly bruised steak. There can't surely be such a thing as a rare film by the single more famous film-maker ever, but even the silent ones are at least commercially available. Yet, there's one film that, currently, qualified as rare. Waltzes from Vienna was made by Hitchcock under some duress - it really wasn't his kind of picture at all and he later told Francois Truffaut that he made it during his 'lowest ebb'. When I was commissioned to co-write a book about Hitch, I wanted to make sure that I'd actually seen the films. This might sound obvious, but I know of a couple of authors who've written extensively about material that they'd not bothered to watch, which is why certain errors get passed on from book to book. One film, The Mountain Eagle, is lost - the last remaining print of it disintegrated decades ago (Hitchcock pragmatically didn't seen too upset by this development, describing the film as 'awful'). A trip to the USA gave me the opportunity to pick up almost all of his silent films and a few early talkies, but after five months one film eluded me. Waltzes from Vienna has, to date, never been released commercially and as far as I'm aware has never been shown on television. The only way I could see it was to rent time with a stack of film reels and a moviola. It's by no means a great Hitchcock film; there are few of the directorial flourishes we associate with him even in this early period. But it's entertaining enough, telling the story of how Strauss the younger finally won the respect and admiration of his father. Thanks to the wonders of the internet, and thanks to various differences in American copyright law, you can actually watch the film at Archive.Org. But if you've managed to collect all of his other works, you'll find a hole where Waltzes from Vienna should be. Today, I made the first approach to someone who might be in a position to rectify this. Let's see how far this campaign goes. So, after a conversation with an experienced blogger last night, I've just made a few deletions from this thing. Funnily enough, the entries where I was most open and revealing about my life are the ones that were badly written and completely lacking in any real insight. So - bye bye bad story about getting drunk and boorish. Bye bye an entry about someone else's embarrassing goodbye email to people she'd worked with for two weeks (cruel to mock and it'd be relatively easy to piece back who I was writing about) and bye bye that one entry that, two years down the line I have no idea what I was on about. Now... what should I write about today?